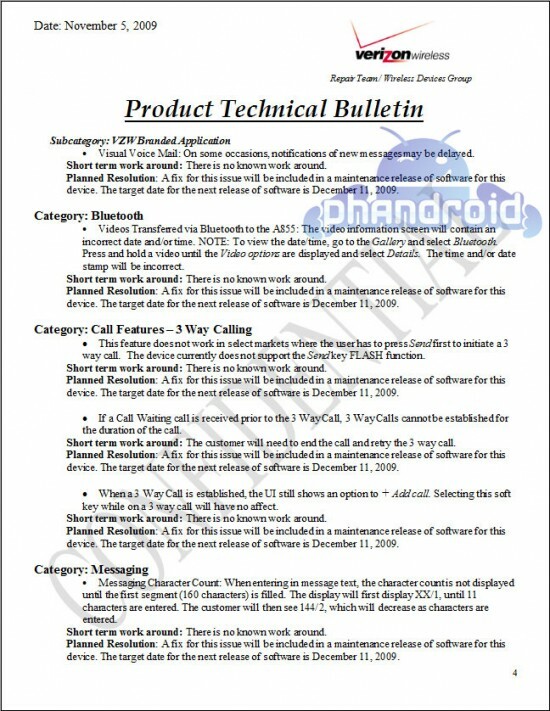 Motorola Droid OTA Update Coming December 11th? 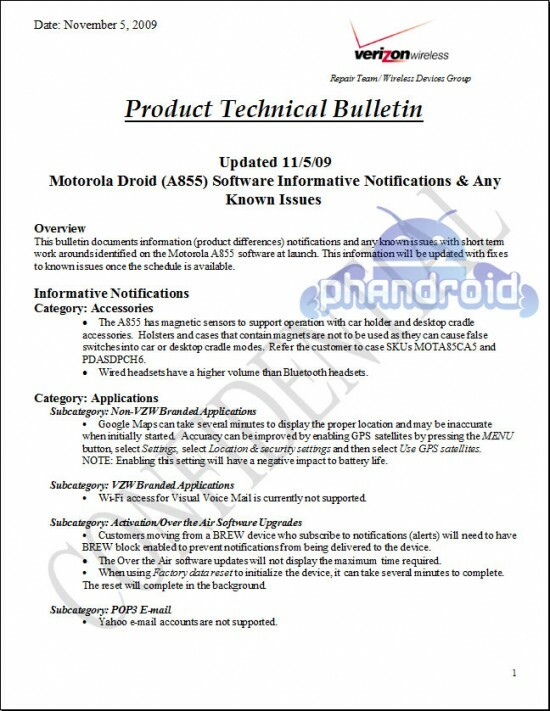 The Motorola Droid was launched less than a week ago but we’re already eying a December 11th OTA update that will cure a defined list of software issues. Defined by who, you ask? Verizon Wireless themselves. 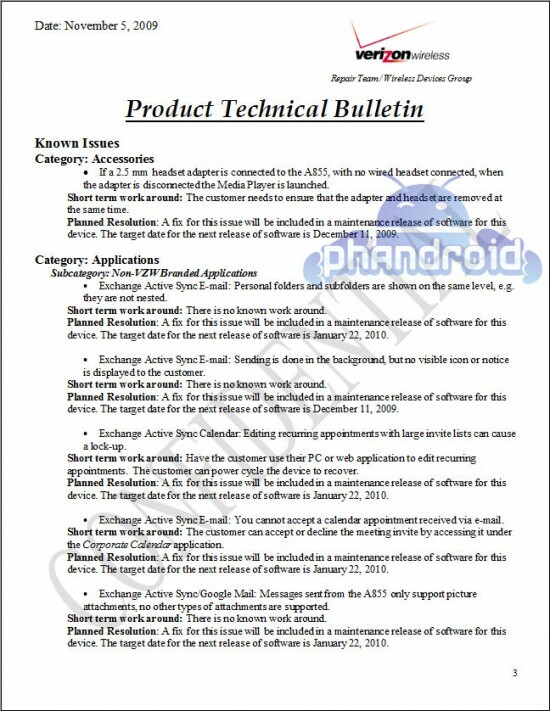 An anonymous tipster has sent us an internal 5-page document detailing problems with the Droid, something they claim was furnished to all Verizon Tech Support reps. 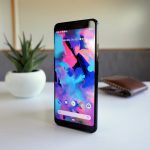 The tipster claims a December 11th OTA update will fix the problems. 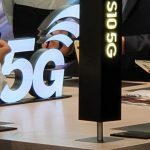 Don’t be irritated that there are so many problems, instead be grateful that Verizon/Motorola/Google are meticulously tracking all of the known issues and working hard to release an OTA fix for them. Pretty amazing that we’re able to get such a quick turn around time in the first place. If an OTA update comes on December 11th that would be pretty impressive indeed. The only reason that so many problems exist is that your phone has so many capabilities. If all it did was call people… it would work flawlessly. With more features come more areas for potential bugs. 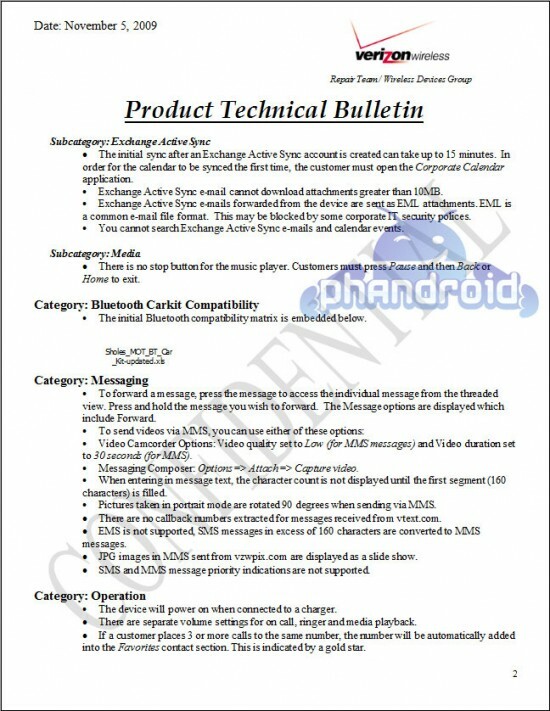 And there are a LOT of features in Android. I’m not so much concerned with the bugs as much as how they are addressed and if the documents below are any indication… these folks are really on the ball. 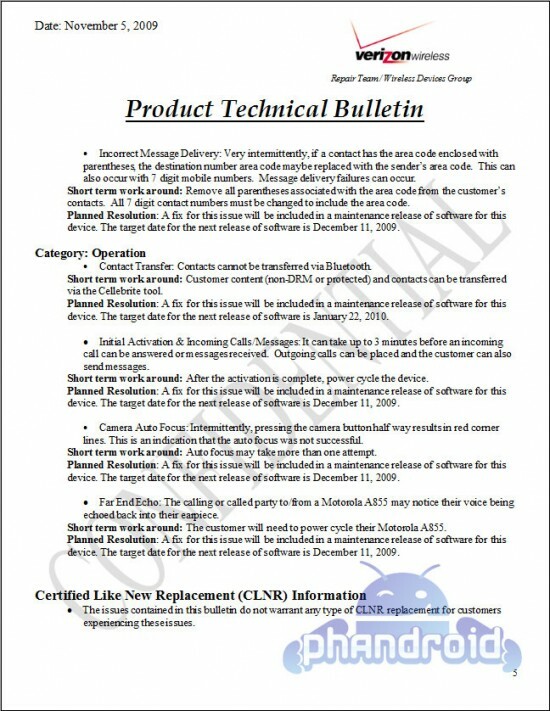 Notice the last page of the document details camera auto-focus problem with a targeted resolution date of December 11th but just above that we see bluetooth issues with a target resolution date of January 2010 – we’re not sure if there will there be 2 updates in 2 months or if their target date is just THAT flimsy – but either way it’s apparent SOMETHING is coming down the pike. Are you experiencing problems with your Droid? Is your issue on this list? If so – are you happy? If not – share it below!